Until this year, by far the dumbest and most destructive economic policy enacted in Washington in my lifetime was the imposition, by President Richard Nixon's administration, of wage-price controls, to counter the national "emergency" represented by an inflation rate of about 4.5%. The controls program was an utter disaster. The inflation rate spiked up during the period of wage-price controls, as you can see from the graph. It caused numerous shortages and mini-calamities, and did enormous damage until it was ended three years later. Unfortunately, the people in Washington are far too dumb to learn from even relatively recent disasters. Thus, this year, wage and price controls have been reimposed, this time on the health care industry, in the form of the "Affordable Heath Care act," which over a year ago I called a proposal of economic insanity. The news has been filled with numerous "unintended consequences" for weeks. These include substantial health insurance premium increases for individuals and businesses, and over a billion dollars taken in charges against earnings by businesses. Now, McDonald's Corp. has sent a letter to federal regulators saying that it might drop its heal insurance plan for nearly 30,000 workers, unless regulators waive one of the provisions of the health care bill. The letter was reported on Wednesday by the Wall Street Journal (Access). This is a typical mini-calamity that occurs whenever wage-price controls are imposed by the government. This provision was intended to control wages -- keep down the salaries of medical and insurance company executives. The way it would work is to require that administrative costs, including salaries, for any health program could not exceed 15-20% of the premiums received. This kind of wage control was supposed to solve the problem of high salaries. Flipping burgers is a high-turnover kind of job, and many workers at restaurants have no health insurance at all. McDonald's provides a so-called "mini-med" policy with limited benefits so that its employees will at least have basic health insurance coverage. But the administrative costs are substantial. McDonald's has now written to federal regulators saying that it will be impossible to keep administrative costs under 20%, and that unless that requirement is waived, they'll have to end the "mini-med" coverage. This is exactly the kind of unintended consequence that ALWAYS happens with wage-price controls. There were many little mini-catastrophes under President Nixon's wage-price controls, but I'll list two (that I've described before). The one that's always stuck in my mind was that farmers in New Jersey were drowning chickens. The problem was that chicken feed was a commodity whose price was determined by the international commodities markets, and so its price could not be controlled, while the prices of chickens WERE controlled. So the prices of chicken feed went up, and the prices of chickens stayed the same, meaning that farmers could no longer afford to raise chickens. So they drowned the chickens, leading to a big shortage of chickens. Another thing that I remember was that wage-price controls applied to private industry, but not to government agencies. Thus, books and pamphlets sold by private publishers were price-controlled, but books and pamphets sold by the Government Printing Office were not. Thus, you had to pay huge prices for federal government publications, while many publications from private publishers simply became unavailable. Wage and price controls were imposed during World War II, when the country's existence was believed to be in peril. There were shortages of everything from meats to vegetables to gasoline. Unfortunately, the politicians in the 1970s were too dumb to have learned from the WW II experience, and imposed wage-price controls again, and there were shortages of everything from meats to vegetables to gasoline. Now the morons in Washington are doing it again, in the form of wage-price controls on health care and insurance. The Boston Globe is reporting that Harvard Pilgrim Health Care has notified its customers that it will drop its Medicare Advantage health insurance program at the end of the year, forcing 22,000 senior citizens in Massachusetts, New Hampshire, and Maine to seek alternative coverage. According to a Republican analysis quoted by Human Events, some 3 million seniors will be affected by the expected elimination of Medicare Advantage plans. If you or your parents have a Medicare Advantage plan, then you should be prepared. This is the modern equivalent of drowning chickens. It's literally impossible for Macdonald's to offer a legal employee health plan without taking huge losses, and it's impossible for Harvard Pilgrim to offer Medicare Advantage without taking huge losses. In both cases, it's because of wage-price controls. So what's the net result? These are two examples (McDonald's and Harvard Pilgrim) of service providers who are leaving the system. I can guarantee to you, Dear Reader, that there will be many more similar stories in the months to come. Each time a provider leaves the system, the supply of health care goes down, and prices are forced up, by the Law of Supply and Demand. If price controls are used, then health care will become rationed, or completely unavailable -- as happened with meat and vegetables in World War II. You'd think that people in Washington DC today wouldn't be so stupid as to following in Richard Nixon's footsteps, but if you think that then you would be wrong. Each day that this "Affordable Health Care" bill is law, more and more health care insurers and providers will reduce or eliminate services. This will reduce the number of service providers, and either drive up prices or force rationing. You'd think that all those intellectual geniuses in the Obama administration would understand something as elementary as that. But there's also a dark side to this. How is the Obama administration reacting to this kind of news? They're reacting by threatening retaliation against anyone who doesn't do as they say. Later this fall, we will issue a regulation that will require state or federal review of all potentially unreasonable rate increases filed by health insurers, with the justification for increases posted publicly for consumers and employers. We will also keep track of insurers with a record of unjustified rate increases: those plans may be excluded from health insurance Exchanges in 2014. Simply stated, we will not stand idly by as insurers blame their premium hikes and increased profits on the requirement that they provide consumers with basic protections." These thuggish threats are really sickening, and show how pathetic the bunch in Washington have become. I was bitterly critical of President Obama during his campaign and at the beginning of his administration, because he said and did so many unbelievably stupid things. The world was going to change completely on January 21, 2009, because Obama was instantly going to heal the world. He would be guided by facts, not like President Bush, who was guided by ideology and ignored facts. He would cure global warming, close Guantanamo, become friendly with Iran and North Korea, bring a two-state solution to Palestinians and Israelis, beat the Taliban and al-Qaeda, reflate the real estate and stock market bubbles and, of course, provide universal health care. He's failed at all of these objectives, so my comments were completely justified. And it's not just Obama and the Democrats; the Republicans are crooks and liars as well. That's the norm today, as I've said so many times in reference to the fact that almost every financial institution in the world committed fraud in creating the current financial crisis. And as I've said several times before, there's only one good thing that can be said about this health care bill: It's such an economic disaster that there's no chance at all that it will be implemented. This will be increasingly apparent as the number of mini-calamities multiplies. The House of Representatives on Wednesday passed a bill with strong bipartisan support that would raise tariffs on Chinese imports if the Asian giant keeps an artificial lid on its currency, according to the Washington Times. The bill has infuriated the Chinese. A spokesman for China's Ministry of Commerce is quoted by Xinhua as saying that the law violates international law of the World Trade Organization. He said that a trade surplus should not be used as an excuse for trade protectionism. On Bloomberg tv on Thursday, Stephen Roach, chairman, Morgan Stanley Asia, said, "I find it an embarrassing, humiliating debate. ... We don't have to go after China. We gotta figure out how to get our act together.... Our savings rate is below zero." His mention of savings rate is a reference to the fact that U.S. consumers are making consumer purchases that they can't afford, and going deeper into debt. 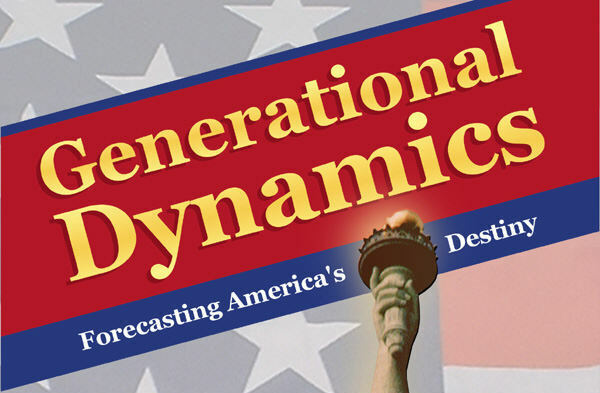 From the point of view of Generational Dynamics, a major stock market crash and financial crisis is overdue, and could occur at any time.